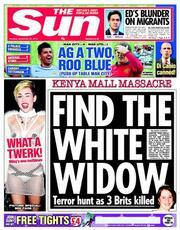 THE Islamist attack in Nairobi has claimed the lives of men, women and children. The al-Qaeda loons murdered shoppers with anything they could use, including grenades and AK-47s. The gunmen did pick out some victims by asking them to take pop quiz: name the mother of the Prophet Muhammad and live. In case you should need this information, the answer is Aminah. As ever, the domestic press is interested in any British links. We know that at least three of the dead are British. But the Mail says one of the killers is too. 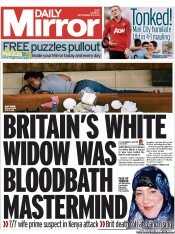 Is this woman – the fugitive wife of a 7/7 bomber – the white, Buckinghamshire born Samantha Lewthwaite? You can read all about her here. Experts believe the British Army soldier’s daughter who converted to Islam has become more powerful in the al-Qaeda branch organisation as a result of their assassinations. Sexual equality is rife among the nutjobs. Lewthwaite, 29, who is a mum of three, was feared to be among up to 15 al-Qaeda gun maniacs who stormed the shopping centre. She may even be still holed up there with hostages — as jihad group al-Shabaab boasted that 15 Kenyan troops laying siege to the massacre mall were killed by one of its brave women. And last night it was feared that one of the ringleaders of the bloody attack is a British mother of three.